Another benefit of tooth-colored fillings is that they are compatible with sealants allowing your child’s dentist to perform both procedures in a single sitting preventing further decay. There are other advantages to composite, tooth-colored fillings, most importantly the capability of bonding to tooth structure. 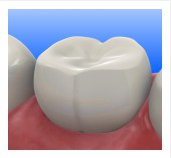 Also in many cases they can be repaired by addition of more composite material. Speak with Dr. Sammie Cima Mazar-Atabaki to find out which kind of filling is best for your child.If you live in or around Aliso Viejo, call or schedule an appointment today.